With the plumbing and electrical wiring run, the installation moves to the windshield spraybar, the ice detection light and the prop. 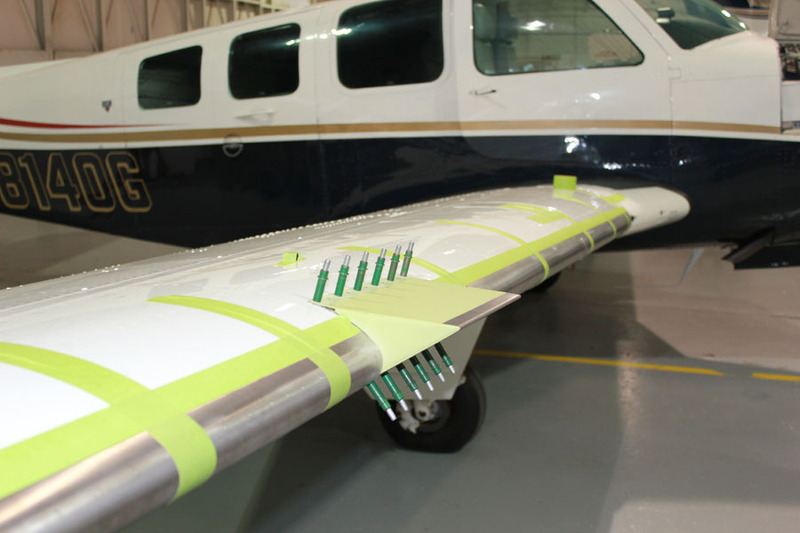 The windshield spraybar on the Bonanza is installed in front of the left side windscreen. 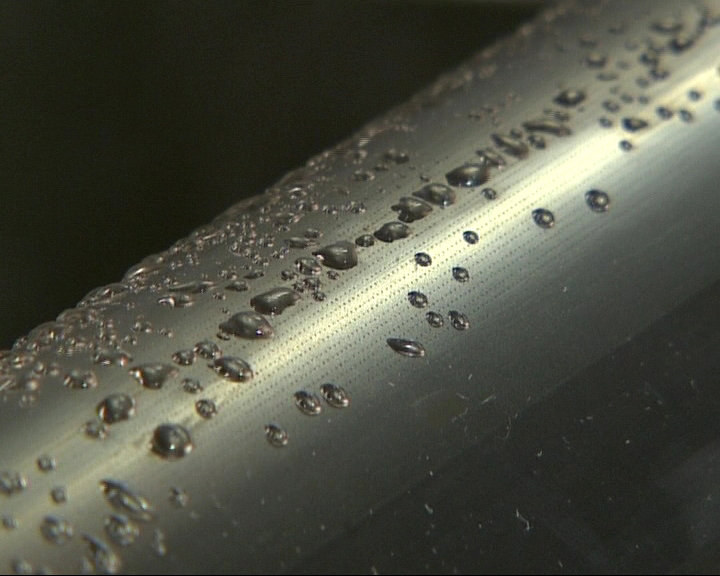 The spraybar itself is a stainless steel tube with 12 holes drilled to jet TKS fluid onto the windscreen. The spraybar is bent to follow the rivet line of the lower windscreen. 1. Windshield spray bar mounted. A deflector is riveted over the spraybar to ensure the fluid flows properly in flight. 2. Spray bar deflector assembly positioned. 3. The deflector is riveted and bonded prior to paint. The windshield spraybar is not running when the rest of the TKS system is active. The spraybar has its own dedicated pump. When the spraybar is activated from the control panel, the fluid will spray for 4 seconds and stop automatically. After a 4 second delay, the spraybar may be activated again if necessary. 5. The windshield spray bar in action. The ice detection light is installed in the lower left cowling in order to allow illumination of the left wing. The ice detection light bracket holds a light bulb which is angled to the middle section of the leading edge of the wing. 6. Ice detection light installed in cowling. 7. External view of the ice detection light assembly. 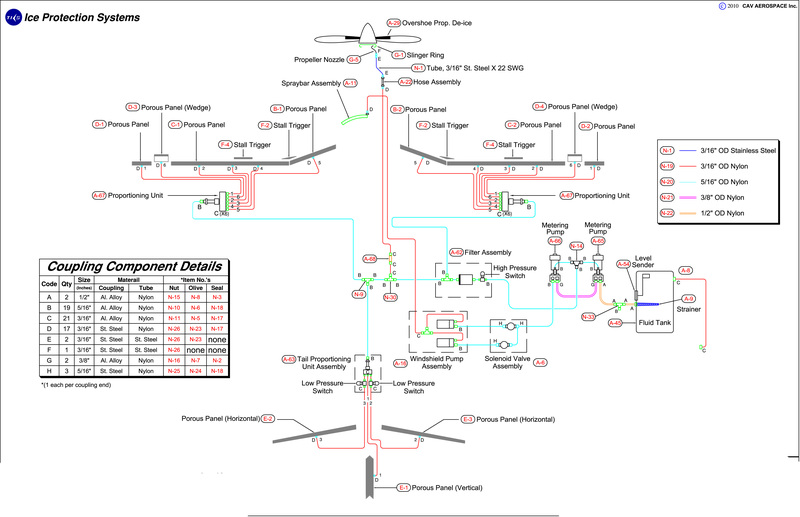 A predetermined flow of TKS ice-protection fluid is metered into a propeller slinger ring through an injection nozzle. Once the fluid enters the slinger ring, centrifugal force directs the fluid to the outermost portion of the ring. 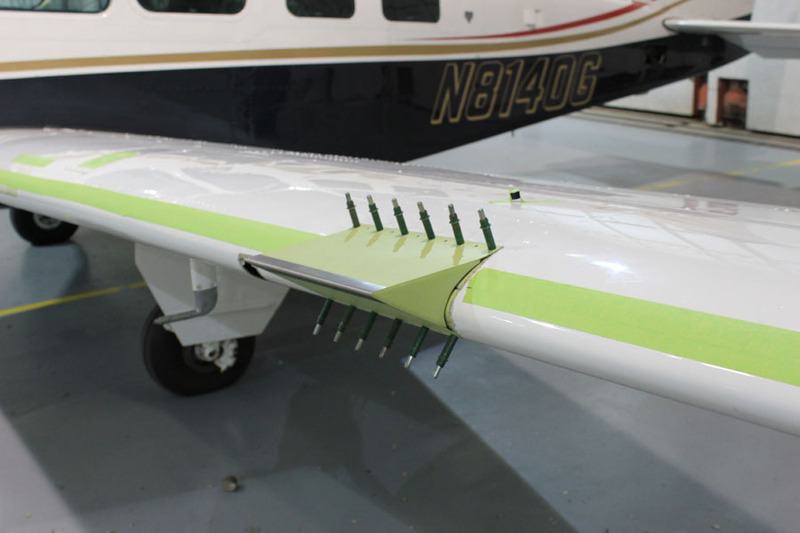 Holes mounted in the slinger ring provide a path for the fluid to travel, ultimately coming out of a tube positioned on the leading edge of the propeller. The propeller blade leading edges are fitted with a channeled boot, providing a flow path for the TKS fluid. The fluid passes out of the feed tube and onto the ribbed boot. Centrifugal force directs the fluid outward. 8. Prop boot. The ribs channel fluid along the prop blade. The manufacturer of the prop will determine the build of slinger required. A McCauley prop will have a slinger ring which is bonded to the prop hub. Scoops mounted in the slinger pick up the fluid and deliver it to the prop blades. A Hartzell prop will have a slinger ring which is mounted in a stand-off position. 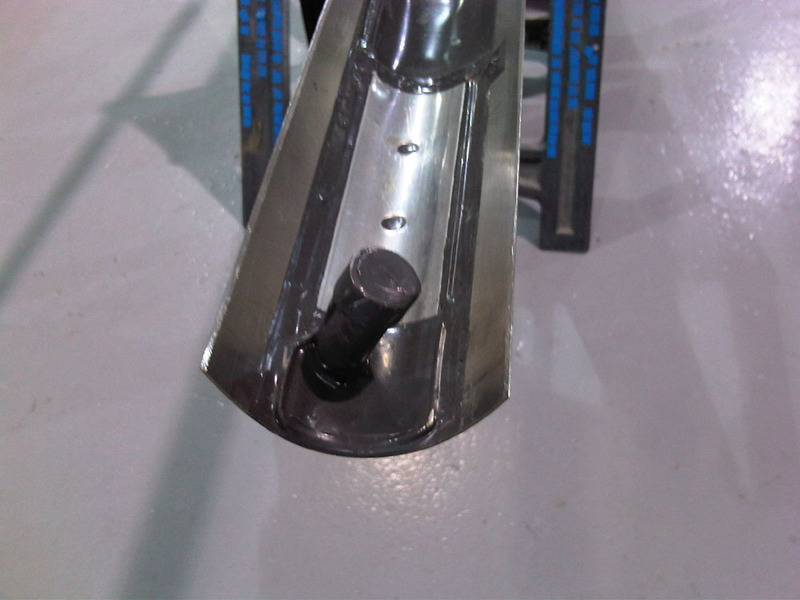 Three hollow bolts are used to mount the slinger to the prop hub. The bolts pick up the fluid and deliver it to the prop blades. MT manufactured props must have a MT manufactured slinger ring installed. 9. A McCauley style slinger ring being mounted to the prop hub backplate. 10. The ring bonded and riveted. 11. The front of the backplate. The riveted scoops with feed tubes can be seen positioned to deliver fluid to each blade. 12. The backplate mounted to the prop hub. 13. Hartzell props have a slinger ring bolted to the spinner backplate. 14. The bolts serve as a channel for the TKS fluid to flow from the slinger ring to the feed tubes. After the propeller has been removed from the aircraft and placed in the prop shop, the prop blades are prepared for the TKS boot installation. If the aircraft was previously equipped with thermal propeller protection, the heated boot elements and all adhesive residues are removed. The prop blades are then cleaned and the area where the TKS boots will be installed is prepared. 16. The prepared propeller blades. 17. Application of the boots. 18. Taped off for edge seal. 19. Sealant applied and curing. The prop will be dynamically balanced after system testing is completed. The main pump draws fluid from a tank positioned in the right wing behind the main spar at WS 127. In order to install the tank two holes are cut in the wing skin. One hole will allow the insertion of the bladder style fluid receptacle and the other hole is cut for the filler port. 1. A template is used to locate the holes. 2. The access hole and filler port hole. 3. The bladder type fluid tank. The tank has a 7.5 gallon capacity with 7 gallons usable. 4. The fluid level sender with float. 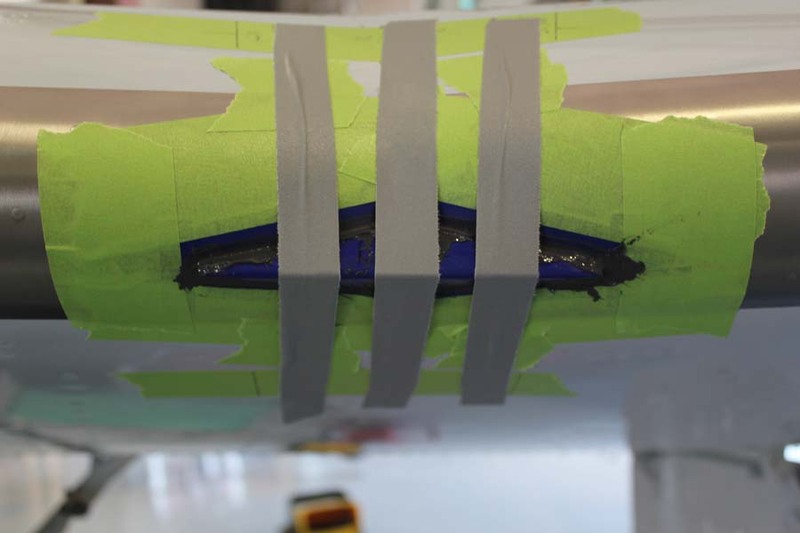 Padding is installed to line the cavity prior to tank installation and doublers are installed to strengthen the structure supporting the filler port and access hatch. 7. Doubler installation with tank flange in the background. Both wing tips are removed and the aileron unhinged. 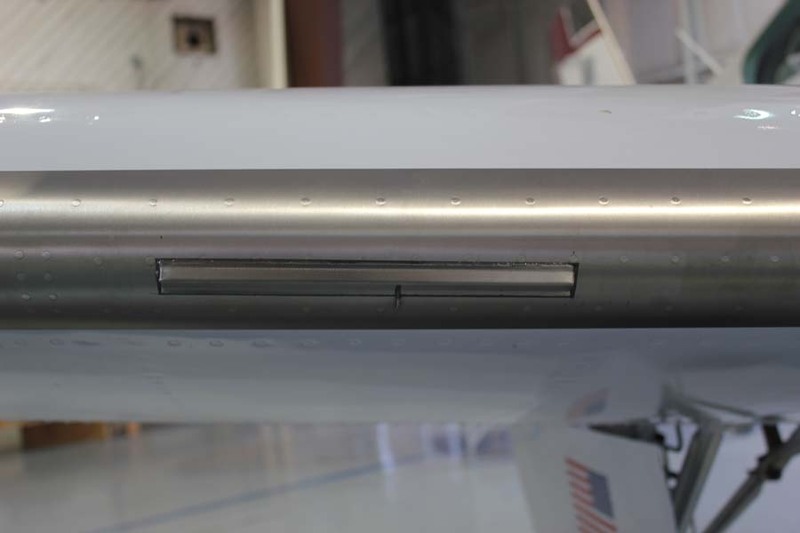 A tank vent is installed in the right wing tip rib and a 3/16″ nylon tube is run from the tank to the vent. 8. Tank vent in right tip rib. The tank installation is finished with the installation of the access hatch and filler port. A locking cap is installed in the filler port to lower the opportunity for foreign fluids or debris to enter the TKS system. 9. Filler port with locking cap. When the fluid is drawn from the tank it passes through a strainer into nylon tubing designed for TKS fluid and the pressure requirements of the TKS system. The fluid is pulled through the main pump and then pushed through the filter to the proportioning units in each wing and the tail. 10. Nylon fluid line running through a grommet to the main pump. 11. A proportioning unit with fluid lines attached. The lines will split the fluid out to the porous panels in precisely metered amounts. 12. Fluid lines passing through main cabin to the proportioning unit in the left wing and tail. Separate lines split the fluid out to the prop slinger and windshield spraybar. 13. Tee fittings in the cabin splitting fluid flow to TKS components. Look for Part 5 here. Fluid is supplied to the panels and propeller by a single positive displacement, constant volume metering pump. The pump provides various flow rates to the panels and propeller. The single two speed pump provides a range of flow rates for different icing conditions. 1. The TKS ice protection main pump. 2. The TKS filter assembly. A network of nylon tubing carries the fluid to proportioning units located in the wings and tail of the aircraft. The proportioning units divide the flow into the volumetric requirements of each panel or device supplied through the unit. Each panel and device is fed again with nylon tubing. 3. A proportioning unit in the Bonanza’s tail section. On an aircraft being certified for FIKI the system is configured with two metering pumps, each of which can be independently operated as the primary source of fluid delivery via a toggle switch on the control panel. This configuration provides required redundancy. There are two modes of operation for Bonanza identified as NORMAL and MAXIMUM. Normal mode represents the design flow rate for the system and is achieved by running one pump continuously in its normal setting. Maximum mode is provided as a means to navigate the maximum intermittent icing envelope, and is enabled by running one pump continuously in its maximum setting. Maximum is twice the flow rate of Normal. 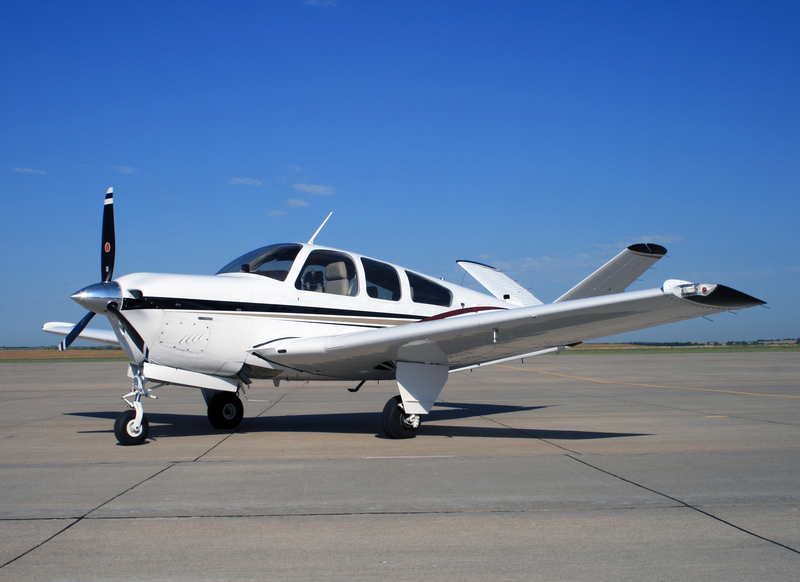 The TKS system on the Bonanza includes two pressure switches. The High Pressure switch is located between the main pump and the filter. An indication of high Pressure indicates the system filter requires replacement. The Low Pressure switch is located between the filter and the proportioning units. When the TKS system is initially engaged the Low Pressure indicators will flash until the system has come up to pressure. Once the required pressure is achieved the low Pressure indicator will extinguish. An indication of low pressure after the indicator has extinguished is a serious fault and requires action is taken in accordance with procedures published in the Flight Manual Supplement. 5. High and low pressure switches. Look for Part 4 here. With the prop pulled and the aircraft in a disassembled state the installation moves into panel layout and tank installation. The TKS laser drilled titanium porous panels are specifically designed for each model’s leading edges. 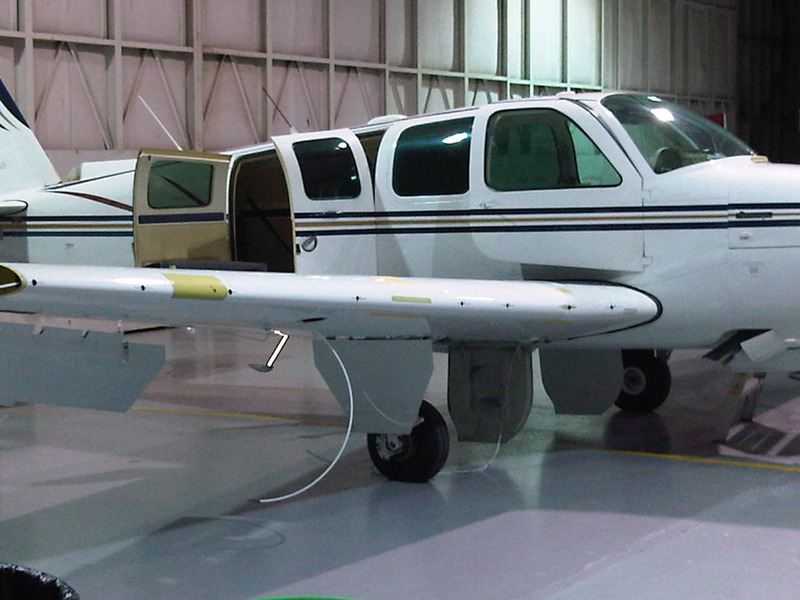 Panels from a Cessna 206 or Piper Saratoga cannot be used on a Bonanza. Even panels from a B36TC or F33A will not work for a G36. 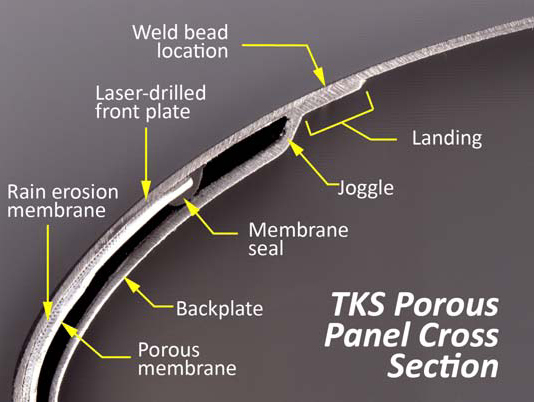 A cross section of a TKS panel. 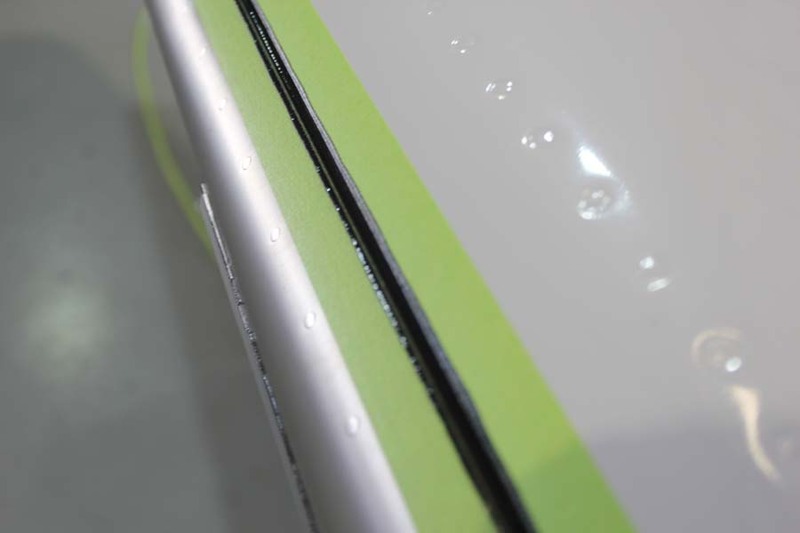 Leading edge protection is achieved by mounting panels to the leading edges of the wings, horizontal and vertical stabilizers. The outer skin of the ice protection panels are manufactured with 0.9 mm thick titanium; providing excellent strength, durability, light weight, and corrosion resistance. The outer skin of the ice protection panels are manufactured with 0.9mm thick titanium. The panel skin is perforated by laser drilling holes, 0.0025 of an inch in diameter, 800 per square inch. The porous area of the titanium panels is designed to assure fluid coverage from the best rate of climb speed to maximum operational speed. The back plate of a typical panel is 0.7mm thick manufactured stainless steel or titanium. It is formed to create a reservoir for the ice protection fluid, allowing fluid supply to the entire porous area. A porous membrane between the outer skin and the reservoir is designed to assure even flow and distribution through the entire porous area of the panel. The porous panels are bonded or attached as a cuff over a leading edge. 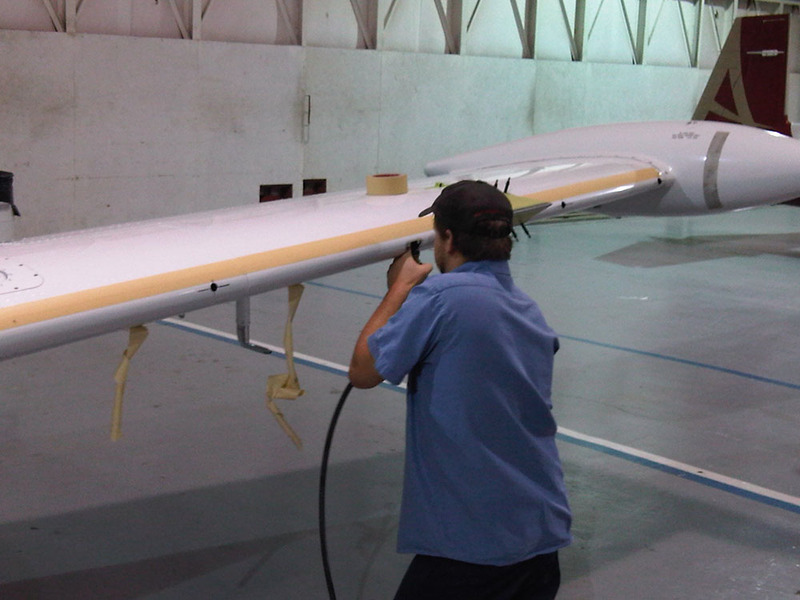 Panels are bonded to the airframe with a two-part, flexible adhesive. Most high performance general aviation singles and twins utilize the cuff method. The design philosophy of the initial panel configuration was to blend both the practical and aesthetic attributes of the system. 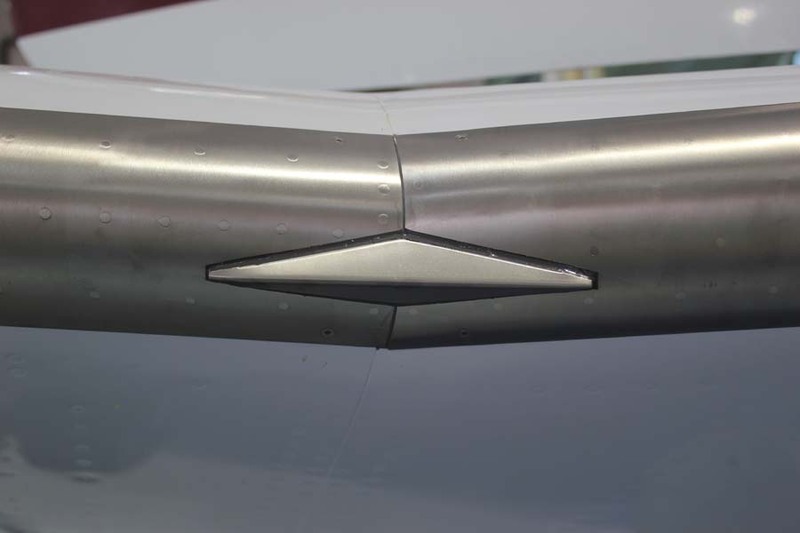 Panel lengths are designed to bridge areas on the aircraft between distinct visual discontinuities. This visual philosophy tends to apply directly to practical panel designs, yielding the simplest and most cost effective results. The greatest limiting physical factor is panel length. The porous panels have been located in the same airframe areas that would be afforded protection by a boot system. 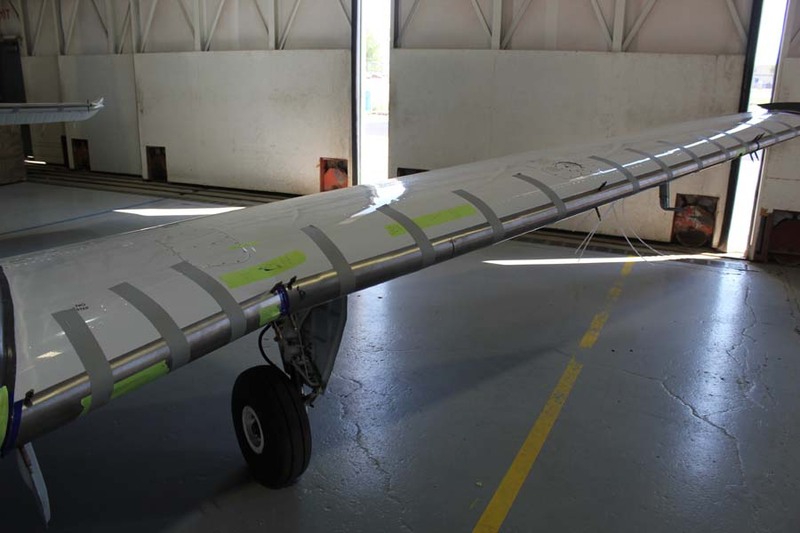 This enables the system to provide full coverage of the leading edge of the wings, and horizontal and vertical stabilizers, excluding the dorsal fin. TKS fluid beginning to flow from the laser drilled holes in the TKS panel. 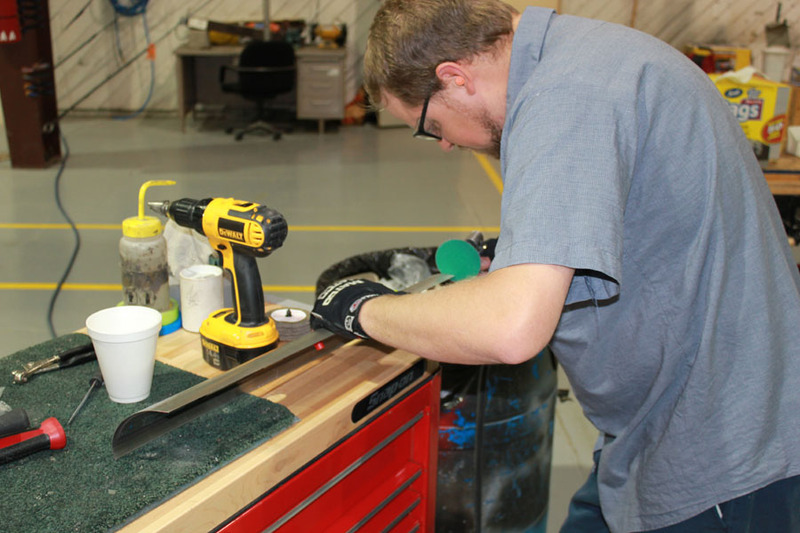 Our primary panel installer, Brandon Ramage, begins the panel installation by laying out the panels and determining the exact points at which he will need to drill the openings for the panel fluid inlets and air outlets. The fluid inlet port on a TKS porous panel. 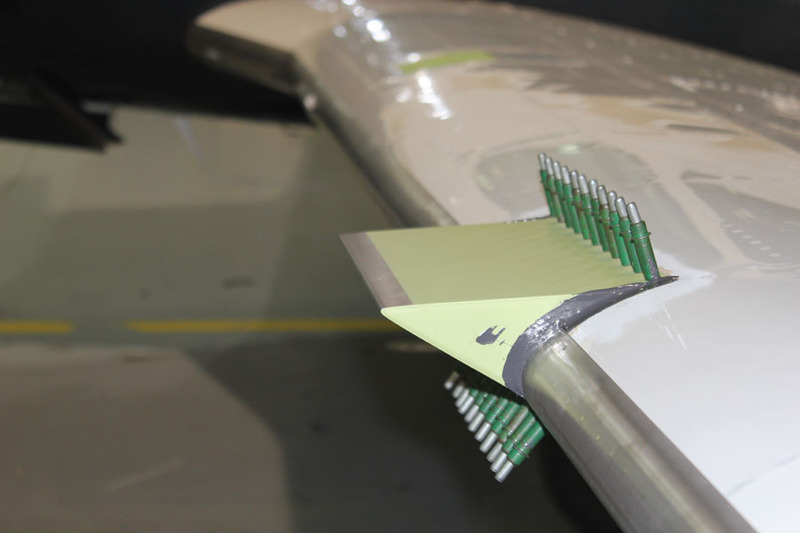 If the aircraft is a 1984 or later 36 model then the vortex generator ( the wedge ) on each wing must be removed. The TKS replacement will be temporarily installed to allow proper alignment of the TKS panels. A36 with the wedge removed. The wedge is temporarily held in its position with cleco fasteners. The holes for the panel ports are located and drilled. In order to fit the panels with precision the edges are ground and the panels themselves are sculpted. Properly fit panels will have very small gaps and less dead space where ice can accrete. Holes for the panel ports located and drilled. TKS panels fit to the right wing prior to bonding. Aircraft being fit for Flight Into Known Icing systems will have their original stall vane assembly removed and replaced with a heated stall vane assembly. 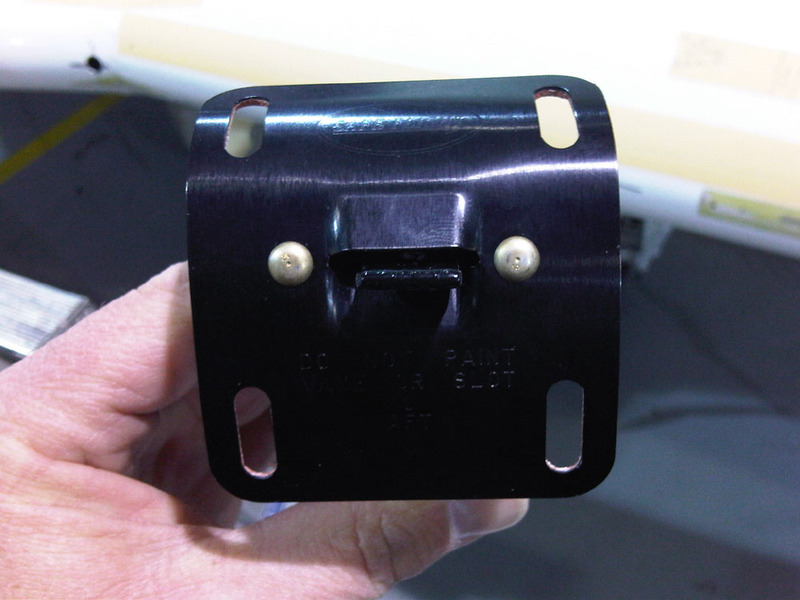 The heated stall vane is also an option for no hazard TKS installations on some Bonanza models. Preparing the leading edge for the heated stall vane assembly. The heated stall vane assembly. 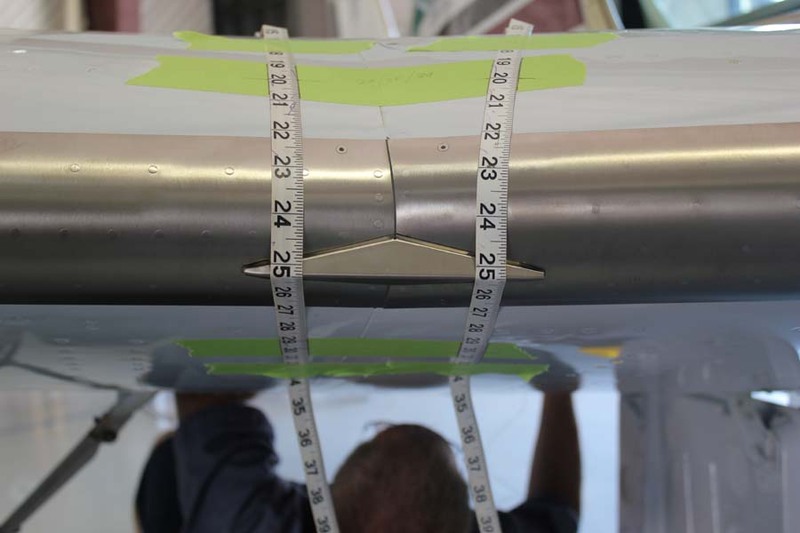 When the panels have been worked to fit correctly they are connected to the nylon tubes which will feed the TKS fluid and are bonded to the leading edge. The bonding agent is a PRC type material. The panels on a left wing bonded and in the cure process. The wedge bonded to the aircraft. It will also receive rivets. Once the bonding agent has been allowed to cure, the stall strips are bonded onto the panels. 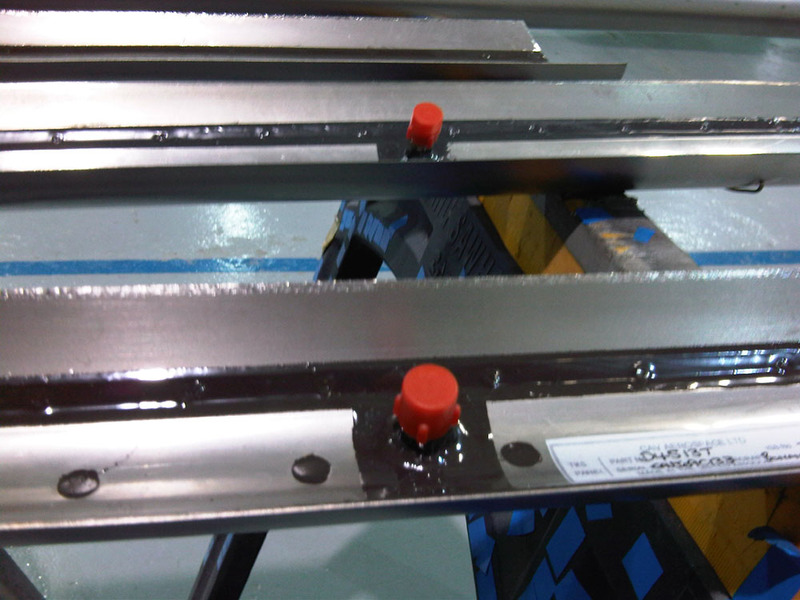 The stall strips are made of porous titanium and fed TKS fluid by tubes. A stall strip being located along the bonded titanium panels. Inside each stall strip is a foam material which soaks in and allows the fluid to weep from the front. 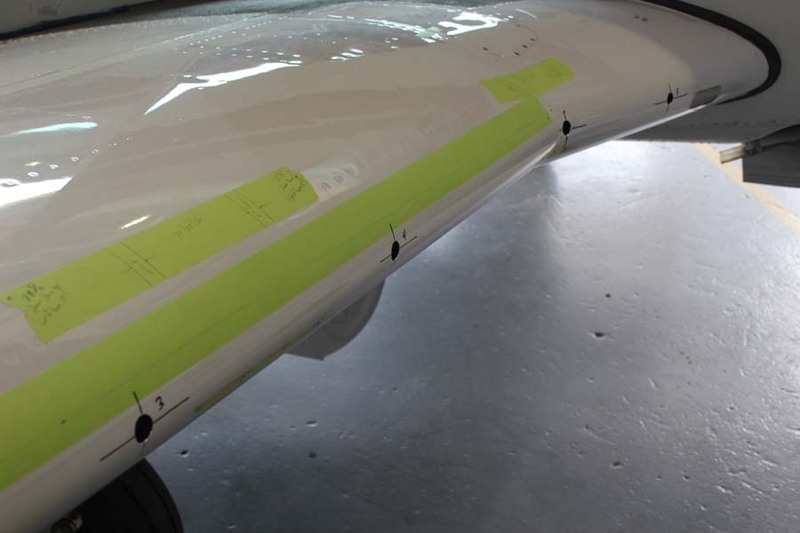 The stall strips are precisely placed to ensure they continue to function as designed and that there is no adverse effect on the aircraft’s performance. A stall strip with feed tube. The final step in panel installation is edge sealing. Masking off the panels for the edge seal application. 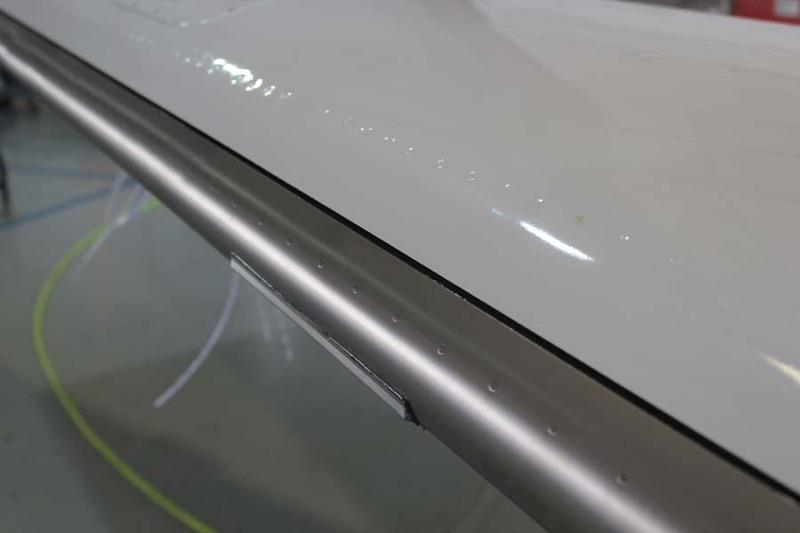 The edge sealant is the same material used to bond the panels to the skin of the aircraft. Laying the bead of edge seal. 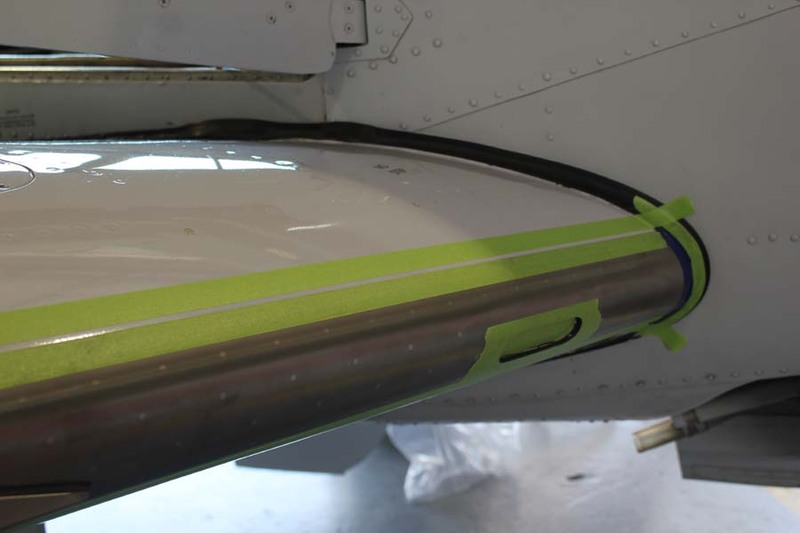 The sealant is not required to prevent fluid from getting between the panel and the aircraft skin. 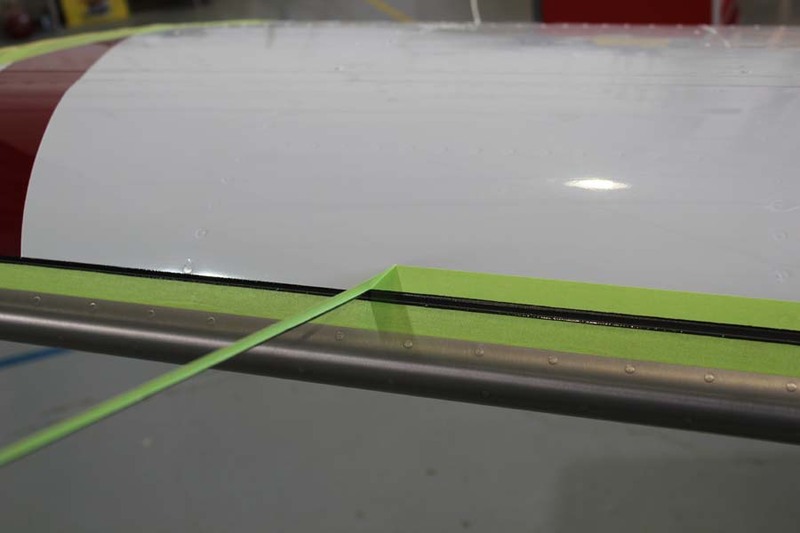 The method used to bond the panel to the aircraft skin keeps fluid out. Look for Part 3 of the Bonanza TKS Installation here. One of the great pleasures of my job is being there to watch aircraft owners’ faces as they approach their baby for the first time after we have completed a TKS installation. Another pleasure is listening to the comments on the craftsmanship as the initial inspection progresses. Those aircraft owners know that we put a tremendous amount of work into the installation but are often not exactly sure what that work was. From my experience reading the posts at BeechTalk (see the TKS Installation threads here and here ) aircraft owners are very interested in the work that goes into the installation. Please note that the following pictures and descriptions do not necessarily happen in sequence. While there are steps that must happen sequentially, many of the work items can be done in parallel. Look for the next post on the Bonanza TKS installation here soon.